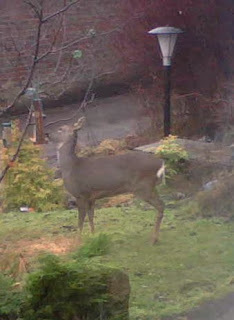 This roe deer was hungry enough to spend a lot of time snacking from one of my bird feeders. After emptying the feeder, the deer browsed spilt seeds on the ground before finally losing its nerve. They must be hungry to be so bold and therefore we need to be careful not to disturb them so they can conserve energy after this bad winter.